Google Home 'Max' is the company's new premium AI speaker | What Hi-Fi? We have the Google Home. We have (rumours of) the Google Home Mini. 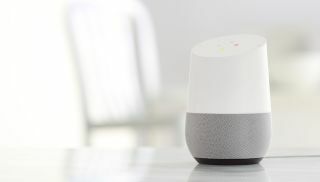 Now, seemingly completing the putative trio is the Google Home Max - a bigger, more sonically impressive speaker intended to rival products like the Sonos Play:3, according to sources speaking with 9to5google. 'Max' might not be its eventual name, but it's said the new speaker will have stereo drivers. This could mean dual mid-range drivers and perhaps a single tweeter - but realistically we'll just have to wait and see. The larger speaker made its appearance alongside the Home Mini (and Google's as-yet-unknown headphones, seemingly ready to rival Apple's AirPods). This news comes after Amazon, arguably Google's biggest competitor in the smart assistant game, announced a greater array of Echo products. This includes the upgraded Echo wireless speaker and the larger, more powerful Echo Plus. We expect this speaker to finally be unveiled at Google's launch event on October 4th, although it's unclear how far down the production process it currently is. If it's delayed (or, indeed, turns out to be just a rumour), the lack of a premium, sound-focused Google Home speaker could give the upper hand to Amazon's speakers and Apple's HomePod. Only time will tell.